One of the quickest and easiest ways to instantly improve your smile and overall appearance is with a smile makeover with porcelain veneers, which can drastically improve your smile in as few as two office visits. Veneers are ultra-thin shells of enamel-like porcelain that are handcrafted by master dental ceramists and permanently bonded to the front of the teeth. They are as strong as your own teeth, more durable than dental bonding, and resistant to future discoloration or chipping. Many cosmetic dental problems can be instantly resolved with veneers: they can close gaps, cover chipped and crooked teeth, and conceal discolored teeth that do not respond well to whitening procedures. Placing custom dental veneers requires a high degree of technical skill as well as attention to detail. Each case is designed individually to match and enhance characteristics already present in each patient’s teeth. Will The Porcelain Veneers Look Like Normal Teeth? With proper care, porcelain veneers will brighten your smile for well over a decade. We will ensure that your dental veneers are crafted from the highest quality porcelains and are bonded with the most advanced and proven materials available. To prolong the life of your veneers, don't use them as tools to open and cut things. If accidental breakage or damage occurs, it is usually possible to replace only the veneer involved. As you can see below from the before and after photos, veneers can make a dramatic change in the appearance of your smile. Can You Explain The Process In Which The Porcelain Veneers Are Fitted To My Teeth? The dental veneer procedure can often be completed in two dental visits over the course of a few weeks. The visits are comprehensive and can require several hours of examination and tooth preparation for full-mouth restorations. The examination stage of the veneer process is essential; it determines any oral health concerns that must first be addressed before treatment progresses. Also, your dentist will work with you to select the best tooth color for you from a special shade chart. As a part of this process, your dentist may recommend teeth whitening before you begin the veneer treatment plan to achieve optimal results. Imaging technologies can also provide you with a preview of your expected results and before and after images allow you to view other successful cases. Once the examination process is completed and the plan designed, the treatment phase begins. The treatment phase itself has several steps. First, your dentist will likely administer a local anesthetic so you will be comfortable during the procedure. Then, the tooth is prepared by minimally reshaping the tooth to provide the best fit. The tooth preparation for a porcelain veneer is always dictated by what the veneers need to compensate for. Based on diagnostic wax-up models, we will be able to determine the optimum position and dimensions of porcelain veneers. 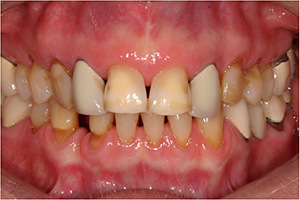 With this knowledge, we will then conclude how much tooth structure needs to be altered. Next, we will make an impression of your teeth from which a mold of your mouth will be made. At this point we will also take numerous digital photographs utilizing sophisticated camera equipment as there truly is no better way to communicate to the laboratory the desired results than with digital photography. Since there is an approximately two-week period during which the laboratory must manufacture the veneers, temporary veneers must be fitted. The temporary veneers will give you a preview of the expected outcome and also help us identify adjustments that may need to be made during the development of the permanent veneer. During the greatly anticipated second office visit, we will remove your temporaries and begin the artistic process of fitting your permanent veneers. We will spend a great deal of time ensuring an optimal fit and fine-tuning the color match with special dental cement to make certain of a perfect color match. At this time, a bite evaluation will also be performed to ensure years of enjoyment out of your newly created smile. The dental veneer procedure requires no recovery period, although some people may experience some sensitivity for a few days afterward. 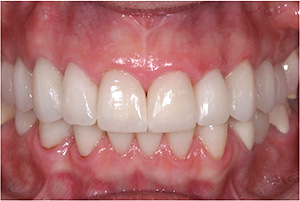 Following placement, we will discuss with you proper veneer maintenance designed to maximize longevity.